Wednsday, August 1 , 2018, 10:00 A.M.
Legal Description: The Northwest Quarter (NW/4) of Section Fourteen (14), Township Twelve (12) South, Range Twenty-five (25) West of the 6th P.M., Trego County, Kansas being 160 acres more or less. Land & Equipment Location: From Collyer, Ks. go 2 ½ Mi. East to 150 Ave and 2 Mi. South to CO RD I will be the Northwest corner of the property. From the Voda exit on I-70 go 1/2 mile South on 180th Ave to CO RD I and go 3 miles west to the Northwest corner of the property. General Information: This tract of land has 140 of cropland with the balance being farmstead and grass. The property is not currently enrolled in any government program. Minerals: Sellers shall convey 100% of the seller’s minerals to the purchaser. All minerals are believed to be intact. Title Insurance and Closing: Owner’s policy and closing expense will be shared 50/50 between the buyer and sellers. Mortgage policy, if required, will be the expense of the buyer. Closing shall be on or before August 24th, 2018. CONDITIONS: Buyers are encouraged to verify details and view property prior to the auction. Announcements made day of sale shall take precedence over printed material. 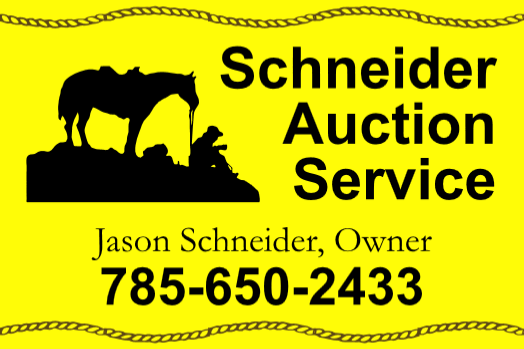 This auction sale is not contingent upon the purchaser’s ability to finance the purchase. Buyers must make finance arrangements, if needed, prior to the auction.